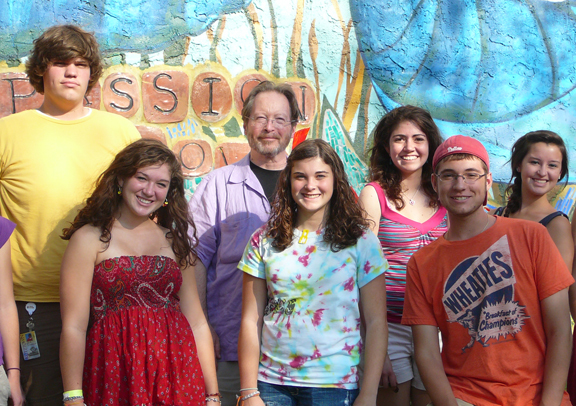 Dean Mowder and Freshmen at the Passion Flower Mural. Bill Mowder, Dean of the College of Visual and Performing Arts (CVPA) chartered Bieber buses to bring new students in our college to Philadelphia last Saturday. 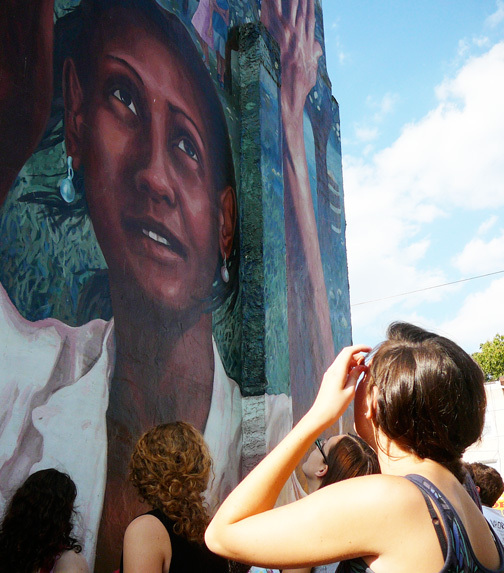 Communication Design Profs Kate Clair and Kevin McCloskey joined the students’ trip which included a guided tour of some of Philadelphia’s famed murals. Last year, Jane Golden, the director of Philadelphia’s Mural Arts Program, or MAP, spoke at Kutztown University. We learned that the largest employer of artists in the Commonwealth of PA isn’t a publishing house, a university, museum, or a greeting card company. 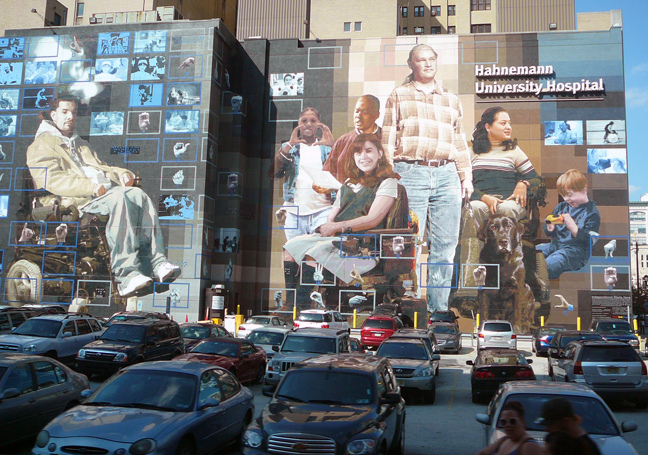 It’s the Mural Arts Program, founded in Philadelphia in 1984 and still going strong. In fact, this program is among the largest arts programs in the nation. In recent years the program has employed roughly 300 artists and art educators and paid them a combined total of over 2.2 million dollars per year. The 2010 “First Year Text” for the incoming students in the CVPA was the book, More Philadelphia Murals and the Stories they Tell, by Jane Golden and others. The Dean’s office contacted the Mural Arts Program and arranged for guides to get on each of the charter buses and take us on a tour. Some of these areas were impoverished, but were rich with pride in their murals. 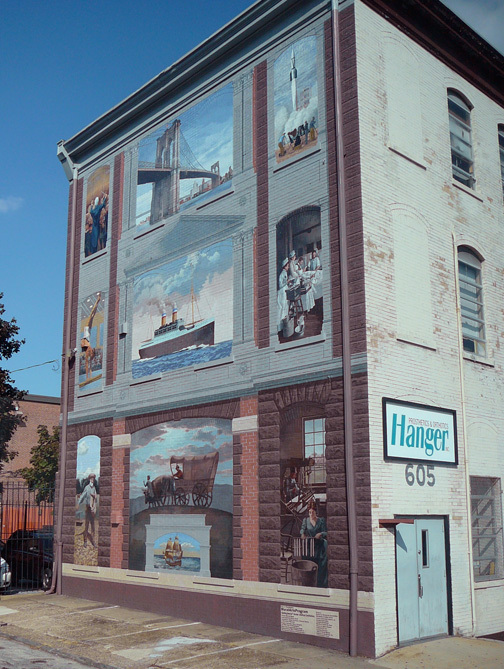 Many of the murals reflected the ethnic identity of a particular neighborhood. We saw Irish-American, German-American, Italian-American and African-American themes. 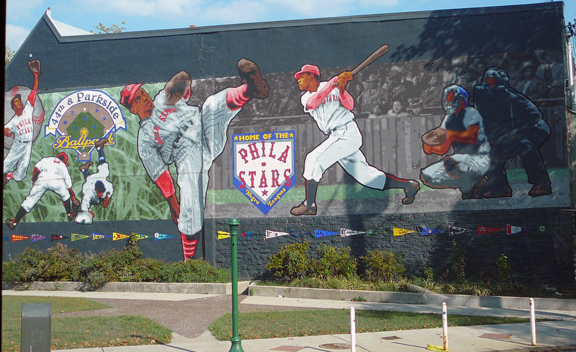 Anyone can wander around Philadelphia and find these murals on their own. However, the Mural Arts Program supports its projects and the local community through guided tours. They have guided walking tours, trolley tours, and Septa train tours. They even have bicycle tours May through November. Schedules and more info are available at their website, www.muralarts.org. If you like a bargain, sign up for the weekly newsletter, FunSavers, at the Philly Fun Guide site; they sometimes offer half-price deals on official mural tours, and other arts events in Philly. < Previous Heads of State: You Are Invited!